I was so excited yesterday morning to see snow had actually settled. I jumped up opened all the curtains for K to see too, then rushed down stairs to let captain Rupert out for a play. He had never seen snow before and although there was not much on his patio enclosure he enjoyed exploring and trying to work out what all this white cold stuff was about. I carefully drove down the road to the new house. It was lovely to see all the snow on the trees just hanging, it almost felt alpine. I met the chimney sweep and the carpet fitter. I took this picture for K to see what the new carpets are like. 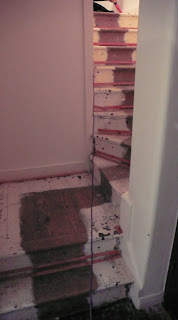 Its another picture of the stairs, empty rooms are just not that interesting. Its all ready for the furniture. We are going to collect it from suffolk where it is very kindly being stored. Its going to be so fun finding everthing again after two years its amazing what you can live with out. Theres not too much to do after that but still alot. Cuboards, curtains, and I'm sure we will find some other things! I have been taged twice! The instructions are: Each player of this game starts with "6 weird things about you". Each person who gets tagged needs to write a blog post of their own 6 weird things as well as clearly state this rule. After you state your 6 weird things, you need to choose 6 people to be tagged and list their names. Don't forget to leave a comment that says "you're tagged" in their comments and tell them to read your blog for information as to what it means. So here are my six weird things. 1. Well the first ones easy, I love rabbits. I get so excited when I see wild ones nibbling by the road side, or see anything with a rabbit on. 2. I love to cook anything out of flour. I'm not sure if its in my genes as my grandpa was a baker. I find it just magic how you mix this dust with water or eggs, or milk, or butter it tunrs into something edible. 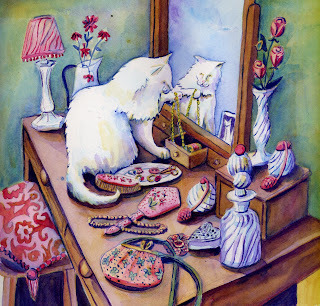 4.I'm very happy packing up my paints and paper. Then sitting quite happily somewhere K's sailing for long periods of time. 5. I hate campsites but love camping out wild with K. Its abit scary but you get some great views. 6. I'm not really very good at shopping. I love window shopping but when it comes to making my mind up about anything I find it hard so end up coming out the shop with nothing. That was so hard. I really apologies to the people that I will tag. So who to tag? We have had our first weekend doing work on the new house. We tried out the wood burner which lit ever so easily. I could not resist taking the little chair down even though we are not moving in for a week or so. I apologies for the quality of the pics I'm still getting used to K's new camera. It was these or nothing so I thought I would post them anyway. I tried the rayburn out which did heat the water and the radiators its going to get a bit of getting used to. We had a little lunch cook on it, it was all so warm and lovely. 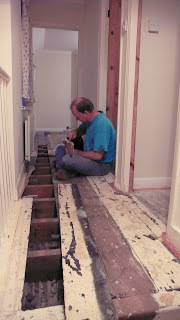 The carpet has all been taken and K did a fantastic job pulling up floor boards and tying in the joist's to the wall. Another thing I could not resist was to take all my bird mugs down and a couple of rabbits. Captain Rupert can't wait to move. 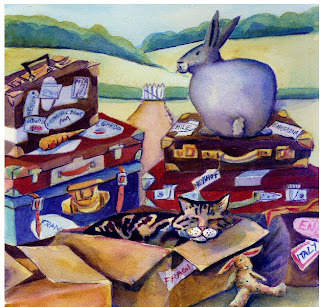 He has already packed his bags and found a friendly cat as a travelling companion. He is so hoping it won't be much longer till he gets his little paws onto the grass in the new garden. 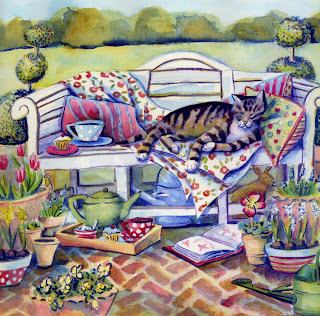 A purr-fect garden. I started this before christmas and should of finished it then. We have been to measure up for curtains at our new little house at lunch time. We took pictures of all the windows just to remind us as what it all looked like, as well as measuring. 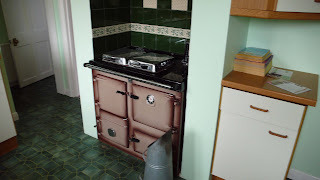 I wanted a picture of the little Rayburn I'm looking forward to stoking up and keeping warm on wet days like today. leg is not painted in. We have just got back from a lovely time over Christmas and new year. Christmas was spent with our families in Suffolk. Captain Rupert had a lovely time with Duck and Rabbit. Although looked on rather disapproving when Duck took such delight in having a frog for a snack. Captain Rupert was very lucky and got a big willow ball to chew for Christmas and a fleece rug to keep him warm. We both had colds which was a shame but we ventured out to try and work of some of the wonderful food. 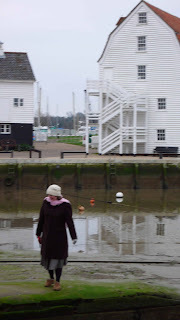 Christmas day by the river in Woodbridge, K was trying out his new camera. Boxing day there was hardly any wind so K decided not to sail and joined me for my walk along the Orwell river to Pinmill while all the sailors drifted along. 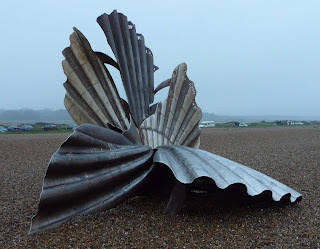 A strange a shell sculpture found on the beach at Aldeburgh. 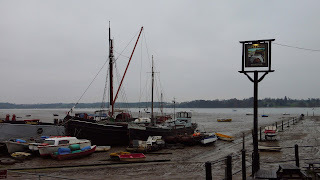 We left Suffolk and headed up the motor way for the welsh hills where we spent a very nice but wet New Year. 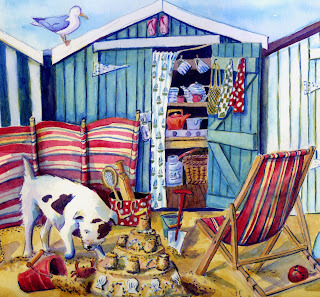 We did not take any photo's it was too rainy and windy but had some good walks and enjoyed drying out in the evenings. I have been tagged by http://weirdbunny.blogspot.com/. Who was having these thoughts on Christmas or easter. Its very tricky I love winter for sitting next to the fire and warming up after long walks. Spring though has so much energy. Everything is waking up and growing which is so exciting. Bunnies will always win, they are my favourite. I did meet two very nice reindeer selling mistletoe and christmas trees just before christmas. I had never seen a real one before. I was amazed how small they are. There feet are so weird a cross between hoofs and webbed feet. It was very interesting to see. I'm veggie so I will give both a miss. Well I do love bunnies. Thats tricky too. Chocolate is always so good. Easter or Christmas?Both are very special and different. I like christmas because every body gets together when otherwise we are rushing around. Easter and the days a longer and getting warmer I love the blossom and the excuse for all the rabbits.